I just could not be happier about the arrival of sunshine and blossoms in the Bay Area. It makes me want to play outside until dark and cook dinner on the barbeque. And the colors of Spring give me energy in a way that not even a Venti Caramel Macchiato can. If I wasn’t a graphic designer I think I could be a landscape designer. Everywhere I go these days I am overwhelmed with beautiful colors and textures of foliage. I’ve been working hard on my own yard, trying to learn more about plants and how to design a garden. Some of the sites that I find helpful are www.weekendgardener.net and www.hgtv.com (go to landscaping). Even if you don’t have a big yard, an artfully arrange potted plant can make a beautiful welcome on your front porch or small patio. I am working with contrasting colors and textures in my yard right now. 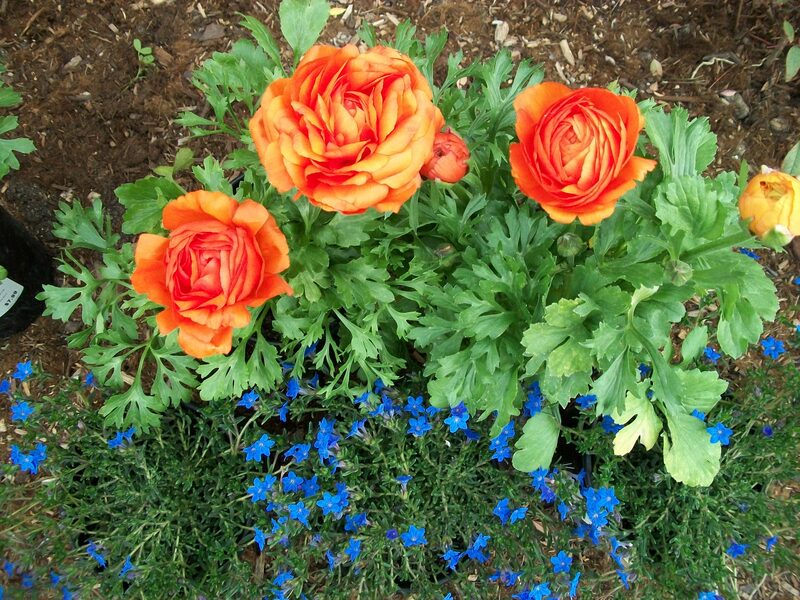 I’m really feeling orange and blue this year, I’ll put the blue low-growing flowers in front so they don’t disappear with the taller brighter juicy orange flowers closer to the house. I’m also loving the grassy plants, which are easy to grow and maintain and add a soft texture. They come in tons of colors and sizes and I think I have planted almost every variety in the last month. Spring inspires more than the amateur gardener, everywhere I shop these days (and I am an excellent shopper) I’m seeing gorgeous jewel tones and my favorites, the pastels. Floral prints mixed with plaids and checks is really hot right now and Magenta is the color of the month for women’s fashion. Even dishes are in on the Spring Thing, with bright floral patterns against black placemats. Love it! 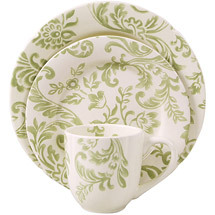 I will just come right out and admit it, I have dishes, throw pillows and bedding for Spring. They all come out of their respective cabinets in late March and they get to hibernate from late September until the next year when the blossoms appear. I buy pretty inexpensive brands (like the Better Homes and Garden dishes above, available at Walmart) so I don’t have to feel too guilty about our brief annual romance and the payoff is that shiny new feeling every Spring when I pull them out to enjoy.